The significance of the Irish Breakfast is on the menu for the forthcoming Georgina Campbell Irish Breakfast Awards 2017 In Association with Failte Ireland, a new and exciting event which was announced today, to be held at The InterContinental Hotel, Dublin on Wednesday 26th April 2017. Representatives of the very best in Irish hospitality and Irish food will be notified across the island of Ireland over the next week of their achievements and will be invited to attend the Georgina Campbell Irish Breakfast Awards 2017 – In Association with Failte Ireland at The InterContinental Hotel, Dublin later this month to receive their special commendations and awards for their excellent contribution to and delivery of The Irish Breakfast experience. The first of its kind, these awards are specifically designed to highlight the importance of The Irish Breakfast to international visitors to Ireland and domestic travellers and aim to support the use of Irish food’s and quality produce as part of the Irish breakfast on offer. The awards also serve to celebrate and promote Irish hospitality providers and Irish food producers who excel in their delivery of high quality produce and the Irish Breakfast experience. Georgina Campbell’s Ireland independent hospitality guides, independent hospitality and travel website www.ireland-guide.com and Ireland’s longest-running food and hospitality awards are highly respected by the Irish hospitality, food and tourism industry. Georgina Campbell’s Ireland Awards schemes are completely independent. Unlike most other award schemes, there is no charge to establishments for recommendation or any element of the awards process. It is this independence which has earned them special respect in the industry, and public trust. Accolades from a respected independent guide are not only a source of encouragement – and very good for winners’ business – but also set a benchmark for others in the industry who are determined to achieve a similar level of excellence. Nominations for all Georgina Campbell Awards are made by members of the independent assessment team, who visit anonymously and pay their bills like any other customer. 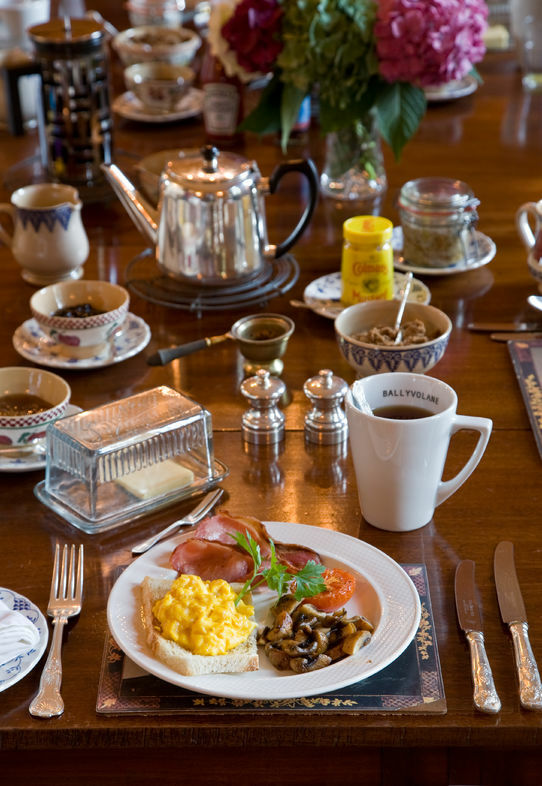  When seeking out the best Irish Breakfast experiences, assessors are looking for quality in all aspects of the experience, including service, and ‘a sense of place’ is particularly commended.  A generous buffet display can be impressive, especially in larger establishments, but a small, carefully considered offering can be equally memorable, especially when it includes some local specialities or unexpected dishes that may not be found elsewhere.  We look for careful preparation and cooking of top quality, preferably local, ingredients to make the perfect traditional Irish Breakfast. 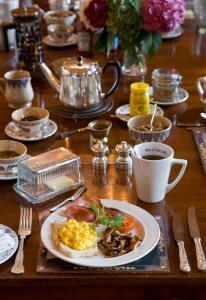 Simplicity is key to its success and, while other dishes and offerings – including options such as a Vegetarian Breakfast or a Seafood Breakfast – are very welcome, a flavoursome rendition of the traditional plate, together with wholesome accompaniments including traditional Irish soda bread and good Irish butter, is the heart of the best Irish Breakfast experience. Georgina Campbell is one of Ireland’s leading food and hospitality writers and current President of the Irish Food Writers’ Guild. Her practical and down-to-earth approach has earned many fans for her cookery columns and cookbooks, and the same honesty has applied to her comprehensive and critically acclaimed, independently assessed guides to Ireland’s best places to eat, drink and stay. Every year Georgina Campbell and her team of experienced assessors comb the country’s hotels, country houses, guesthouses, restaurants, pubs, cafés and speciality food shops seeking out the best food and hospitality experiences for readers of The Georgina Campbell’s Ireland Guide (‘the glovebox bible’) and followers of the website companion, www.ireland-guide.com. • Ireland’s longest running, and independent, awards scheme – Georgina Campbell’s Ireland Awards are based on the Georgina Campbell Guides hospitality selection, which is totally consumer focused and not affiliated to any trade association or marketing group. • Independently assessed – award winners are representative of the very best Georgina Campbell Guide recommendations, all of which are selected solely on merit, as the result of anonymous visits by an experienced assessment team, who pay their way like any other customer. • The Guide and its website offer a unique range of contents – providing comprehensive recommendations for both business and leisure travellers. Unbiased descriptions are given of over 1,500 recommended food and hospitality businesses over a wide range of categories throughout Ireland, North and South. • Restaurant Stars, Deluxe and Outstanding Accommodation listings, Pub Stars highlight the very best establishments.